I hadn’t written mine down Kara. This is a great post. I thought it would take me the longest of all the posts I’ve read of yours and worked on today, but this just popped onto my page the fastest. Have really enjoyed thinking through everything and making it clear. I needed to find my feet as a blogger before I could do this. I’m glad that this post was quick to digest. I am thankful to be able to help you to clarify your direction and look forward to watching your business grow. Core values define a business and helps build its overall goals. Hi Vidya, thank you for stopping past. I love the truth writers put into their songs. Psychologists have known for many years how key values are to determining behaviour. I love it when things just line up. I hope you were able to identify your core business values. Gosh it’s been a while since I’ve thought in detail about core values. 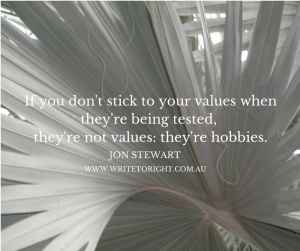 I remember spending hours in a previous job working on the core values of the business! Values for my business right now are pretty much mine so I haven’t outlined them as such…needs some thought. Glad to hear I have reminded you, Nicole. As a sole trader, my personal core values and business core values are the same; I like it that way as it is easier to insert ‘myself’ into my business. Let me know how you go. funny you should mention the ‘how to’, it’s my next post.